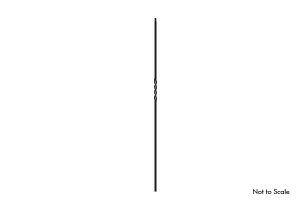 SB1TWISTEX – 1/2″ square x 44″ – wrought iron baluster with 1 twist, stocked in Satin Black. Typically 44″ tall, these metal balusters (sometimes called pickets or spindles) are cut to fit on site. Use with Pitch Shoes (SBPITCHSHOEEX) on raked shoe and hand rail and Flat Shoes (SBFLATSHOEEX) when installing on a balcony or directly into a stair tread. 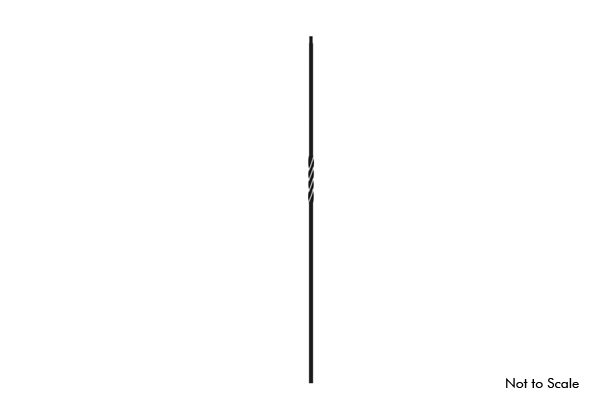 FB1TWISTEX – 1/2″ square x 44″ – Hollow, wrought iron baluster with 1 twist, stocked in Flat Black. Use with Pitch Shoes (FBPITCHSHOEX) Flat Shoes (FBFLATSHOEX). MEGA1TWISTSAT – 3/4″ square x 44″ – Hollow, wrought iron baluster with 1 twist, stocked in Satin Black. Use with Pitch Shoes (MEGAPITCHSHOE) Flat Shoes (MEGAFLATSHOE). SKU: 1TWIST. Category: Stair Parts.